Sometimes I think we're not speaking the same language! Listening is a key skill for IT consultants, but I find myself more often trying to understand what the customer really expects when they say they need a 'site survey'. A 'site survey' can mean quite a few different things and there isn't a standards body to formulate and finalize standard descriptions of site survey terms. Active, passive, predictive, validation, simulated and budgetary are all words I've heard used to describe the type of site survey a customer wanted. Does the customer have an existing wireless deployment? Do they want their current RF coverage documented, then augmented? Augmentation may not be the best solution due to the potentially vast differences in their current access point hardware and antennas vs. the features available in today's access points. Do they want to deploy a new wireless coverage design and disregard their current deployment? What does the customer intend to do with their wireless infrastructure? What types of client devices do they anticipate? What kinds of applications will be used? Is there the potential for high-density user counts? Is any level of real-time location tracking required? Each deployment is different as a result of the building type, building layout, client use cases and customer budget. There are a great deal of questions that need answers before you can accurately define the type of site survey the customer needs. Digital floor plans are obtained and scaled to a known distance. If the floor plans do not have a scale indicated, the scale of the drawings can be obtained by Google Earth measurements or by using a laser distance measurement tool when on site at the facility. This type of survey will not give you accurate data on the RF noise floor that will be present once the final access point infrastructure is installed and operational, as there are a limited number of access points transmitting during the survey period. A Spectrum analysis should also be performed to determine if there are any major fixed sources of interference present in the facility. The RF engineer walks the facility with the survey laptop detecting one or more SSIDs in use at the customer site. The RF engineer may not have access to network credentials to authenticate the the customer's WLAN and would only document the RSSI/SNR detected by the site survey application. If the RF engineer has network credentials to associate/authenticate to the WLAN, additional testing of throughput/load/voice quality could be performed at the customers request. Spectrum analysis should also be performed to determine if there are any major fixed sources of interference present in the facility. If the floor plans do not have a scale indicated, the scale of the drawings can be obtained by Google Earth measurements of the outside wall of the building, or by using known distances common to corporate facilities (doorways are typically 3 feet wide). A software model of the access point's RF coverage is used to place the access point at a given location in the floor plan drawing and predict what the coverage for that access point would be given the RF obstacles drawn by the RF engineer. NOTE: Predictive surveys are not 100% accurate and a post-deployment verification survey should be performed to ensure the desired coverage was achieved through the predictive survey process. The RF engineer would associate/authenticate the wireless client to the customer WLAN with credentials provided by the customer. The RF engineer would also need access to a wired port to do end-to-end testing from a wired client to a wireless client. Hopefully the more we all talk about the different types of site surveys and learn from one another about the words we use to describe them, we'll all encounter less RFPs/RFQs asking for validation surveys for wireless infrastructures that aren't installed in buildings that aren't built yet. 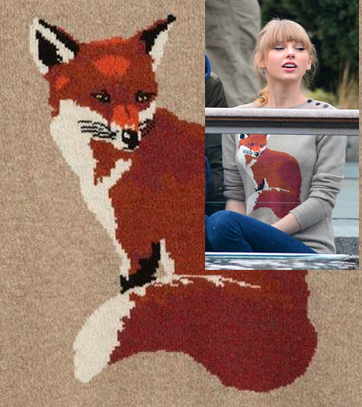 I'm almost embarassed to admit it, but I first saw Aubin & Wills Portland Jumper in this paparazzi photo of Taylor Swift. I'm not a fan and I don't recall how I stumbled across the picture in the first place. I do recall saying to myself - THAT is a super cute sweater! I did a little googling and found out who made it and where I could buy it. 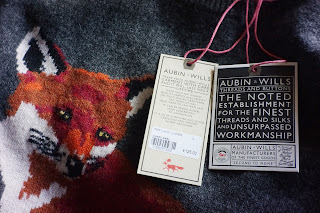 The Aubin & Wills website was sold out of the oatmeal color, but still had a large in charcoal. It was the last one in stock, so I was just hoping it would fit. I didn't see an indicator of where it was made either, so I crossed my fingers and completed the purchase. 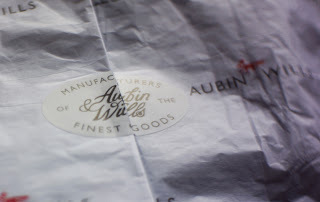 The impression that the Aubin & Wills website gives is that it is a long standing British brand with a long heritage of creating fine crafted goods. They use marketing slogans such as "A genuine refined quality that is always guaranteed." I even found a page on their website about their brand protection. All of this said quality workmanship to me and that I was getting my moneys worth from my purchase. The packaging the sweater arrived in also said quality (custom printed tissue paper, branded tissue seals). I opened the wrapper gingerly, careful not to tear the tissue or the labels. Whenever I receive a package where the item is wrapped with such care, I can't bring myself to just tear into the tissue paper. Inside the sweater was folded nicely, complete with a piece of tissue paper in-between the sweater body and the folded arms. If you look closely, you can see the fox crying a small tear because I can't keep him on principle. 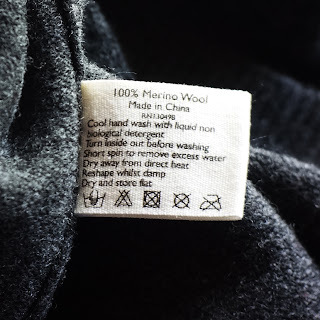 The sweater had fancy hang tags proclaiming "Made from the highest quality fabrics available by the most skilled craftsmen. This product has been made to last and last. It can be passed down from generation to generation. It is to be cherished and loved, cared for and mended where necessary." and "The noted establishment for the finest threads and silks and unsurpassed workmanship." I began to search for the "Made In" tag. It wasn't in the neckline, but I did find it on the side seam. Made in China. I felt duped. I wanted to believe that my purchase was supporting a long standing tradition of skilled craftsmen making well made goods and getting paid well for their work. Instead I found myself holding a sweater that was made in China. There is no way I'd believe that Aubin & Wills sweater factory is any different than any garment factory in operation in China. I returned the item the same day and didn't even try it on. The fact that the brand tries to convey history, craft and quality but delivers goods made in China did not sit well with me at all. I headed over to my favorite place to buy hand made goods: Etsy and dug around a bit to see what I might pay for a custom sweater. There are plenty of people who will knit you a sweater to your custom specifications for under $200.00 any day of the week. 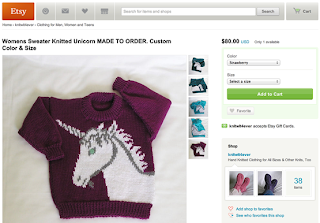 Heck, I even found a lady who knits unicorn sweaters in one of five standard colors, or in any color you want! All for $80.00 USD. I'd much rather put money directly in the hands of the craftspeople instead of going through the unknown conduit of a retail brand website and ending up with Chinese goods. C'mon! You know you want a unicorn sweater! We the consumers have to send the message to the retail establishments that we will not provide the financial backing to support the continued exploitation of the Chinese labor force at below living wages and substandard working conditions. You have to vote with your feet and your wallet.